A DETECTIVE Chief Inspector has been found guilty of plotting with a police colleague to "fit up" two burglars by corrupting an identification procedure. Elizabeth Belton sent a string of incriminating text messages boasting about interfering with a police investigation in order to secure convictions. Jurors heard two men were jailed as a result of corrupt methods used by the West Yorkshire Police officers during the investigation. Belton and Judith Mulligan, a police constable, were today found guilty of conspiracy to pervert the course of justice after a re-trial at Leeds Crown Court. 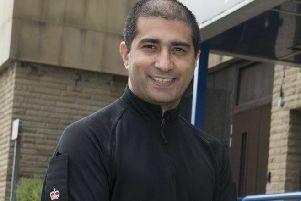 A third defendant, former police sergeant Mohammed Gother, 54, was found NOT guilty of the charge. The offences took place during September 2013 after two men tried to break into Mulligan's home on School Street, Pudsey, Leeds. Mulligan dialled 999 and described two suspects outside her home as being teenagers wearing dark clothing. The pair were arrested and taken to Pudsey police station after checks revealed they both had criminal records. Mulligan contacted Belton about the incident. The court heard Belton sent a text message to Mr Gother, a sergeant at Pudsey Neighbourhood Policing Team, to make arrangements for photographs to be taken of the two suspects. Images of the two men were then delivered by a police constable to Mulligan's house so she could view them ahead of taking part in an identity procedure. Jurors were were told Mulligan attended the former Millgarth police station in Leeds city centre the next day and was able to identify the men. Mulligan also changed her description of the suspects, stating they were older. Scenes of crime officers were unable to find any forensic evidence at Mulligan's home and the investigation hinged on Mulligan's identification evidence. After their convictions, Mulligan sent a text to Belton stating: "That'll teach them to try and burgle a single mum looking out for her 2 children and let that be a lesson to them. stay away from Pudsey!!!" Prosecutor Gaias Gozem said: "What the prosecution say is that what those texts clearly reveal that there was a plan - a plan hatched and successfully executed - to ensure Judith Mulligan picked out the two men that the police had arrested." The alleged offending did not come to light until two years after the incident when the text messages were discovered by "co-incidence". Belton's messages had been sent from a police-issue Blackberry and were found by a detective constable who was investigating an unrelated case. The prosecution said the messages were direct evidence of a plan to corrupt the identification procedure. Mr Gozem added: "You may think it is very important that courts are presented with evidence that is honest, truthful, reliable and credible. Not with police officers who are bending the rules. The prosecutor told the jury of nine women and three men: "It is your job - the job of the jury - to assess who is guilty and who innocent. "It isn't the job of the police to bend the rules." The defendants claimed Mulligan was never shown pictures of the two men in advance of the identification procedure. They described the text messages sent between them as "silly banter". Belton, of Lawns View, Wakefield, and Mulligan, of School Street, Pudsey, showed no emotion as they sat in the dock as the guilty verdicts were returned. Both were granted bail and will be sentenced tomorrow (Friday) by judge Tom Bayliss, QC. It was the second time all three defendants had been on trial for conspiracy to pervert the course of justice. A reporting restriction was in place through the two trials but was lifted after the verdicts were returned. For the latest news from Leeds Crown Court - join our crime and incidents Facebook group here.